Media Analyzer solution provides a structural representation of the inner structure and media validation of QuickTime, MP4, Fragmented MP4, 3GPP, 3GPP2, Flash Video, MPEG-2 Transport Streams, MPEG-2 Program Streams, AVI, HEVC/H.265 (High Efficiency Video Coding), AVC/H.264 (Advanced Video Coding), MPEG-2, ProRes, AAC (Advanced Audio Coding), AC-3, MPEG audio and WAV media files. The main view presents the corresponding headers, offsets and hierarchical structure of the media file, along with all the full parameter list of the corresponding headers. A separate hexadecimal data preview is available, enabled for automatic file data positioning on header structure selection. The solution comes in two versions – Media Analyzer Pro and Media Analyzer Ultimate. Media Analyzer Pro offers QuickTime, MP4 files verification and validation according to the Apple’s QuickTime File Format standard and the ISO/IEC 14496-12/14 standard, MPEG Transport and Program Stream files verification and validation according to the ISO/IEC 13818-1 standard, AVI and DivX files verification and validation according to the Microsoft’s AVI format standard and WAV RIFF files verification and validation according to the Microsoft’s WAV RIFF format standard. 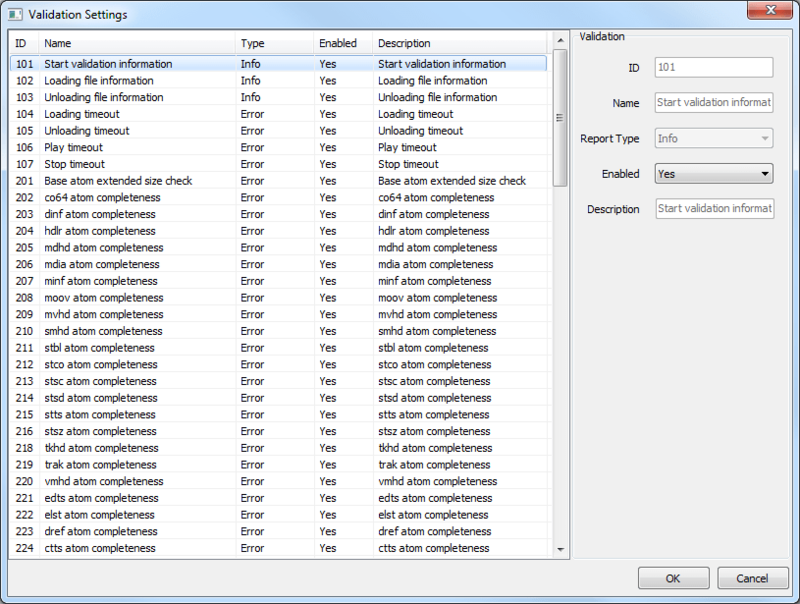 The currently loaded file in the Media Analyzer Pro can be validated by the validation tool integrated in the solution. 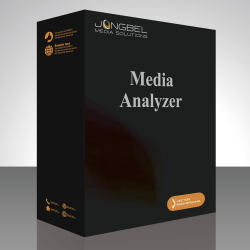 Media Analyzer Ultimate is a product extension of the Media Analyzer Pro. Along with the standard functionality of Media Analyzer Pro, the extended product includes HEVC/H.265 Video Validation, AVC/H.264 Video Validation, MPEG-4 Video Validation, MPEG-2 Video Validation, VC-1 Video Validation, VC-3 Video Validation, DV Video Validation, AAC Audio Validation, MPEG Audio Validation and EBU STL Subtitle Validation modules, which now enables not only the container validation but also the audio, video elementary streams, image and subtitles validation. The elementary streams validation process is performed by on-the-fly demultiplexing and verifiication of all audio and video elementary streams subsequently. The currently loaded file in the Media Analyzer Ultimate can be validated by the validation tool integrated in the solution. Not sure how Media Analyzer will work for you? Along with the presentation capabilities, the Media Analyzer can perform multiple operations on the media files, such as demultiplex, re-multiplex, elements extraction, video streams decoding, SEI message removal, blocks extraction and many more. All container errors, such as important headers absence, incorrect container structure or invalid header values, pointed as mandatory in the corresponding specification are output as Error Report. All container irregularities, which are not pointed as mandatory in the corresponding specification, but have unusual content are output as Warning Reports. Additionally there is a set of Informational Reports, which deliver more detailed information about the file being examined, such as the streams format, media duration, important header fields, etc. .
Each media validation check can be disabled or enabled or set to another report type, such as Info, Warning or Error. The solution can be applied in wide variety of workflows and with many container format deviations due to its flexibility and customization ability. The validation report output can be exported into XML, HTML, PDF, CSV and TXT report file, containing the full report information. This allows easy integration of the solution with any digital media workflow and further processing of the report information with any third party systems. MP4 Media File (.mp4, .m4v). Apple iPhone Ringtone Media File (.m4r). Audio Books and Podcast Media File (.m4a, .m4b). MP4 Protected Media File (.m4p). Microsoft Smooth Streaming Video Media File (.ismv). Microsoft Smooth Streaming Audio Media File (.isma). Flash Video Media File (.f4v, .f4f, .f4x). Visual representation of mov, mp4, fmp4, 3gp, 3g2, f4v and f4f file containers. Automatic hex positioning of the selected atom/box. Export of file atom/box structure. User data appending and extraction. Hex data representation of the file. Hex data editing of the selected atom/box. Extraction of selected atom/box to a separate file. mdat and moov atoms/boxes position switching. Text selection and copy from both tree and hex views. Command-line atom/box structure export – automation. Dual-mode for two files parameters comparison. Visual representation of MPEG-2 Transport Stream. Automatic hex positioning of the selected packet. List of seen programs and PID streams. Search of PID packet, PAT, PMT, CAT, Payload and PCR packet. Search of NIT, SDT, EIT, TDT, BAT, RST and TOT packet. PID stream filtering – file remultiplex with selected PID streams. PES stream extraction from selected PID stream. ES stream extraction from selected PID stream. Program extraction and remultiplex to a new file. Demultiplex of all PES streams. Demultiplex of all ES streams. Hex edit of selected TS packet. Visual representation of MPEG-2 Program Stream. Automatic hex positioning of the selected block. Visual representation of AVI file container. Automatic hex positioning of the selected chunk. Export of file chunk structure. Hex data editing of the selected chunk. Visual representation of WAV file container. Visual representation of AVC/H.264 video elementary stream with start code prefix NAL unit separation. NAL units list view representation. NAL units tree view representation. Hex data editing of the selected Access Unit (AU). Extraction of selected Access Unit into a separate file. Access Unit Delimiters (AUD) removal. Sequence Parameter Set (SPS) removal. Picture Parameter Set (PPS) removal. Visual representation of HEVC/H.265 video elementary stream with start code prefix NAL unit separation. Video Parameter Set (VPS) removal. Visual representation of MPEG-2 video elementary stream. Generic MPEG-2 video elementary stream support. VideoCD MPEG-2 video elementary stream support. SuperVCD MPEG-2 video elementary stream support. DVD-Video MPEG-2 video elementary stream support. DVD-VR MPEG-2 video elementary stream support. DVB MPEG-2 video elementary stream support. MicroMV MPEG-2 video elementary stream support. DVHS MPEG-2 video elementary stream support. HDV MPEG-2 video elementary stream support. ATSC MPEG-2 video elementary stream support. CableLabs MPEG-2 video elementary stream support. Sony’s XDCAM MPEG-2 video elementary stream support. Blu-ray MPEG-2 video elementary stream support. Detailed slice structure – macroblocks, blocks, VLC coefficients, motion vectors, etc. Bitrate transrate of the file. Hex editing of the selected block. Visual representation of ProRes video elementary stream. ProRes frames list view representation. ProRes frames tree view representation. Hex data editing of the selected video frame. Extraction of selected video frame into a separate file. ProRes video elementary stream import from MP4 media container. ProRes 422 High Quality support. ProRes 422 Standard Definition support. Visual representation of Advanced Audio Coding (AAC) audio elementary stream. ADTS frames list view representation. ADTS frames tree view representation. ADTS fixed header tree view representation. ADTS variable header tree view representation. Automatic hex positioning of the selected audio frame. Hex data editing of the selected AAC audio frame. Visual representation of AC-3 audio elementary stream. AC-3 syncframes list view representation. AC-3 syncframes tree view representation. AC-3 Synchronization Information Header (syncinfo) tree view representation. 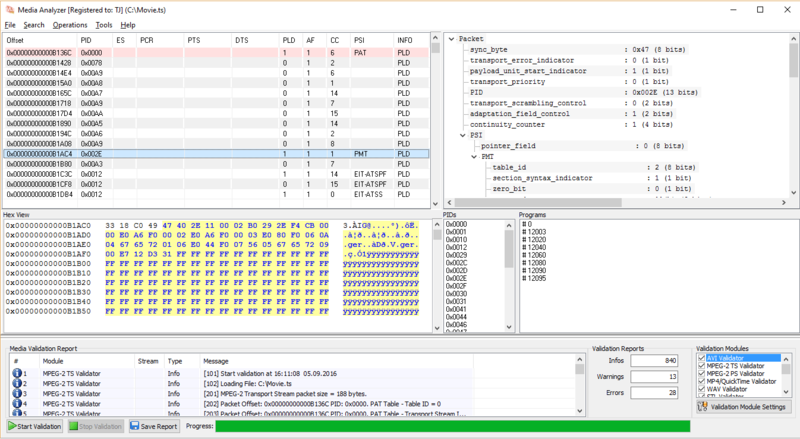 AC-3 Bit Stream Information Header (bsi) tree view representation. Hex data editing of the selected AC3 audio frame. Visual representation of MPEG audio elementary stream. MPEG 1 Audio Layer I support. MPEG1 Audio Layer II support. MPEG1 Audio Layer III support. MPEG audio frames list view representation. MPEG audio frames tree view representation. MPEG audio header tree view representation. Hexadecimal data representation of the file. Hex data editing of the selected MPA audio frame. Visual representation of EBU STL file format. Automatic hex positioning of the selected TTI block. Hex data editing of General Subtitling Information (GSI). Hex data editing of the selected Text and Timing Information (TTI) block. Stream corruptions and gaps check. MPEG TS Packet Sync byte check. Transport Stream Error Indicator check. Stream corruptions, gaps and junks check. MPEG Program Stream Packs check. System Clock Reference (SCR) jump check. Packetized Elementary Stream (PES) header values check. Presentation Time Stamp (PTS) check. Non – RIFF chunk presence. AVI stream format header information. bext chunk check and information. cart chunk check and information. WAV stream format header information. Corrupted XML file while parsing – pointing the corrupted XML line.